We’re now in the Christmas season and though we all get inundated with the commercialism during this time of year, we mustn’t let it get in the way of what is really important. For many of us it is the time of year that we really wish to give to others – whether it be donating to a local charity, bringing items to our church food pantry… or just letting our friends and family know how much we appreciate having them in our lives. We each feel the Divine spark particularly during this season of Joy. With the spirit of giving on our minds, we are doing a “Twelve Days of Christmas” give-away this year. Visit our Facebook page for details. And we decided to make a couple new flavors for our online Christmas packages. One is called Christmas Cookie Fudge. 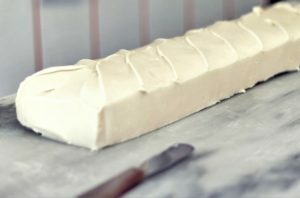 We make a “birthday cake” (flavor) fudge in July to celebrate the anniversary of Murdick’s Famous Fudge. The Birthday Cake Fudge was such a hit that we thought we might make something similar for Christmas. Sugar Cookies are synonomous with Christmas, so we added some almond extract to our white fudge (which has the butter and sugar taste of cake batter) and – VOILA! – Christmas Cookie Fudge! Not crunchy like a cookie– it is smooth and creamy and simply dreamy! 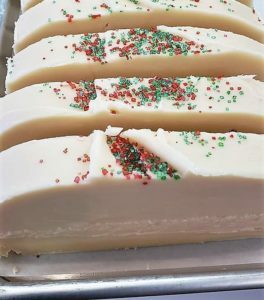 Another new flavor for this holiday season is our Coconut Cream Fudge! Over the years, customers have asked if we ever make a coconut fudge…and we do make a chocolate coconut fudge with pecans that we call: “German Chocolate.” But more than a few customers have said that they wanted a coconut fudge sans chocolate. You asked and we listened! So we are offering a sweet cream fudge with coconut! It tastes like a macaroon cookie, only smooth and creamy. Among our other delighful offerings this season are our famous Pecan Logs. Our pecan logs are (quite simply) one of the best candies we make! If you have never had one, now is the perfect time to try them, as they ship well and taste divine! 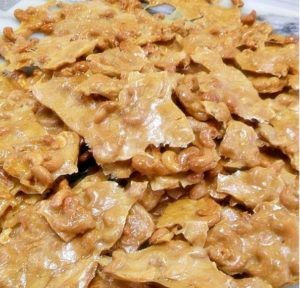 We also are offering our irresistible, buttery Cashew Brittle as a new online item this year. 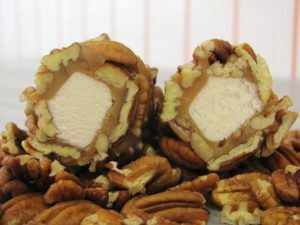 Pecan Logs – Fluffy Nougat dipped in our Homemade Caramel and rolled in Pecans! We trust you will find our website: www.MurdicksMackinacFudge.com easy to navigate so you can check out our packages of fudge and candy offered this year. Above all, from our family to yours, we send our warmest thoughts and best wishes for a wonderful holiday and a very happy new year!